For me, October and November still echo with the anniversary of my ill health. Perhaps after three years that shouldn’t be the case, but “shouldn’t” doesn’t change emotions. I am still processing the grief. The things I have lost, the way I have changed, the limits I feel constrained by. In this loop of emotion, to me Melbourne Cup day is still the day that my friend snuck in pizza – my first culinary break from weeks of hospital food. This Remembrance Day I am back at the Alfred hospital. (Another test, another worry, another sick day.) And I am remembering three years ago. Surreal – so many people! So many people doing normal, routine things. Queuing in cafes. So much sound and movement, my head swivels everywhere trying to take it all in and my eyes feel huge. 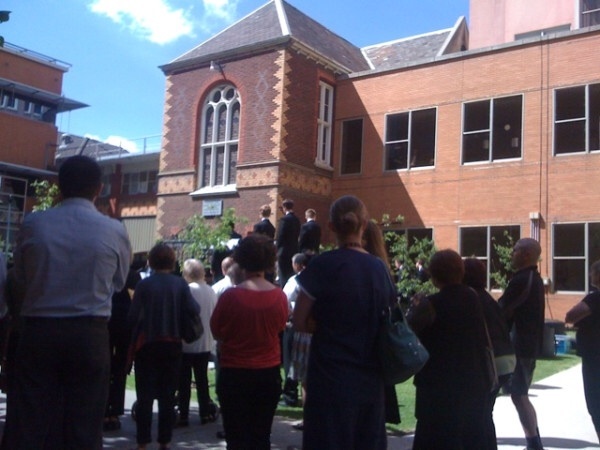 Outside we pass through the sun and Mum parks me in the shade behind a crowd to watch the Remembrance Day service. The breeze is so fresh that every touch of it makes my skin, makes me feel alive and my eyes tear up already. We sit through the speeches and readings and I people-watch. As 11am draws close more and more people gather ’round …even at the windows of the buildings, looking down, looking on. I’d never really thought about the medical staff in war before. Even in current wars. I give thanks – for being here in a country with a great healthcare system. For my doctors. For getting better. For my family and friends. I am so lucky. The wind blows and I cry.